With the Flex, you get three rows of comfortable seating. The Flex can seat up to seven passengers and has a ground clearance of 5.9 inches, which makes it easy to get in and out of the SUV. The available second-row fold-flat 40/40 bucket seats let third-row passengers easily reach their seats. There is also an available PowerFold third-tow seat that can be easily folded flat with the push of a button for additional cargo space. The Flex features ergonomic controls and instruments that are designed with the driver in mind. 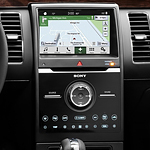 The controls and instruments can be easily read during the day or night to make driving as comfortable as possible.